Chicken Pot Pie Cupcakes- I found this recipe a while back and absolutely fell in love with how simple it was. 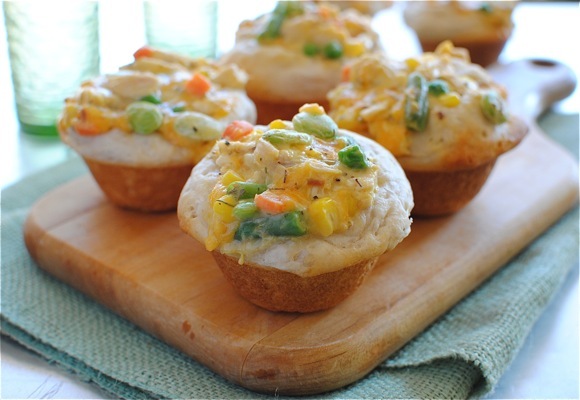 Everything gets mixed up in a bowl and spooned into Pillsbury biscuits, and less than 20 minutes later you're seriously eating chicken pot pie cupcakes! I don't think you understand how cute this is. I'm telling you, the fluffy biscuit texture, the soft creamy filling, the pops of vegetables, the tender chicken, and the TASTE? 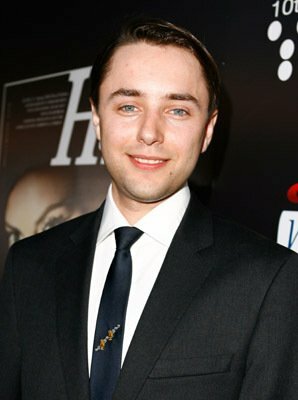 I can hardly even stand it. The taste. 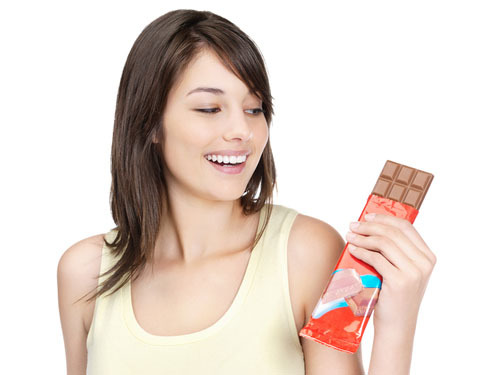 It's like the flavors of comfort opened a day spa and your mouth is getting full treatment. FOR FREE. Head to Tablespoon for this inredible recipe! 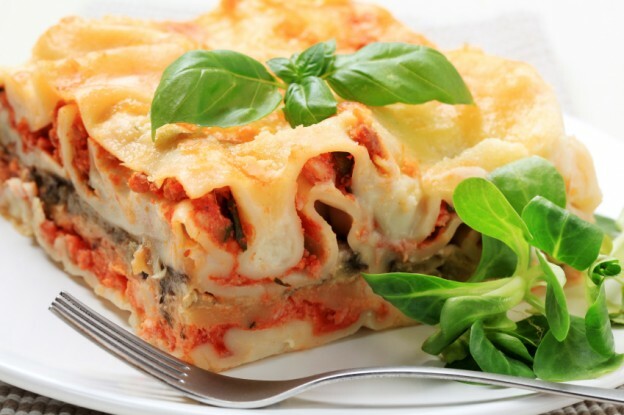 For a quick, make-ahead meal, grab a few cans of veggies to layer into your favorite lasagna recipe. Broccoli, carrots, and squash all pair well with tangy tomato sauce and creamy cheeses. If you don't have time (or energy!) to chop, dice, and saute fresh vegetables in advance, canned alternatives work just as well in a fraction of the time. Head over to Babble for more ideas on how to use cans for a quick and healthy meal! 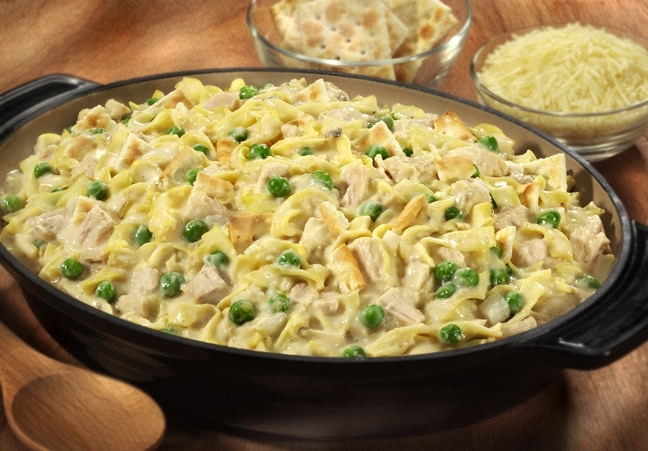 A can of Cream of Mushroom Soup is mixed with tuna, egg noodles and peas, topped with a crunchy bread crumb topping and baked to perfection. Head to Pinch My Salt for this delicous recipe! Recipe notes: This recipe makes a fairly small casserole but it can easily be doubled if you have a large family or like to have lots of leftovers! *Don’t overcook the pasta! Read the package for times and use a timer. **If you don’t want to use fresh bread crumbs, use the seasoned dried kind from the store and cut the amount in half. Toss the seasoned dried breadcrumbs in one tablespoon of melted butter before sprinkling over the top of casserole. ***I now use a good quality parmigiano reggiano sprinkle on the top but we grew up using the stuff in a green can. Just use whatever parmesan cheese you normally keep on hand. 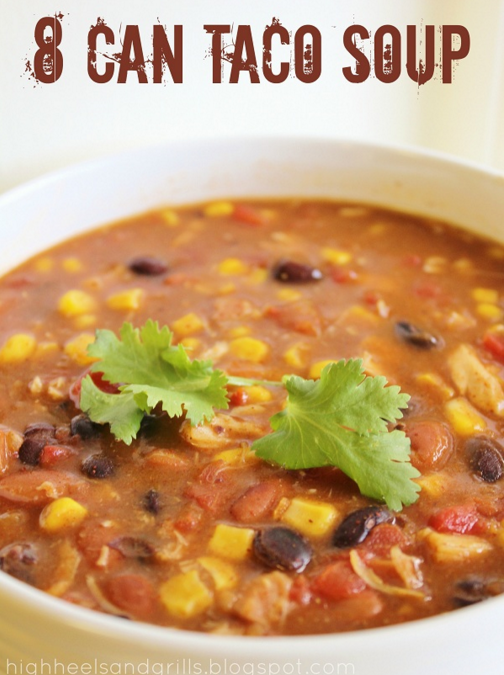 Clean chili recipe with ground or leftover turkey, full of veggies and is cooking while you sleep. One Monday night while watching The Biggest Looser, a contestant named Ken made a veggie turkey chili. I adapted his recipe to a slow cooker. 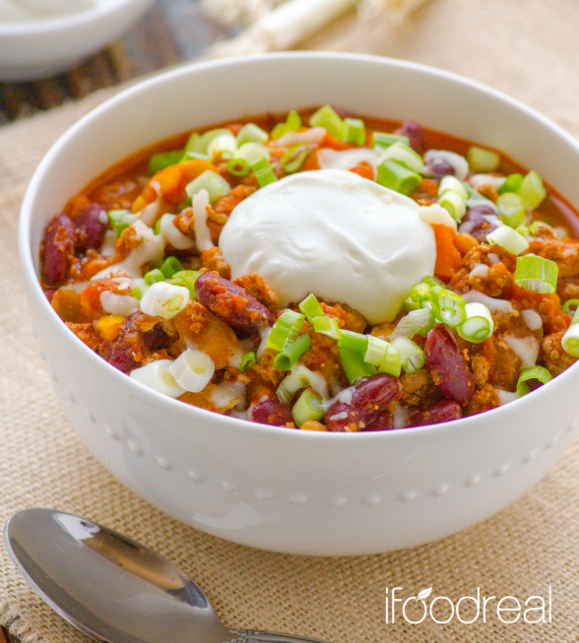 This chili is full of delicious veggies and healthy lean turkey meat. Head over to iFood Real for this amazing recipe. Preparing these vegetarian enchiladas is a real cinch. Simply saute the onion, sweet potato, bell pepper, spinach, and black beans in a skillet. To cut corners, you can use store bought enchilada sauce, or if you really want to win at life, you can make your own homemade sauce. When it comes time to prepare enchiladas, I’m all about the tortilla pre-soak. All it takes is a quick bath in enchilada sauce to make the tortillas super tender, flavorful, and melt-in-your-mouth-esque. 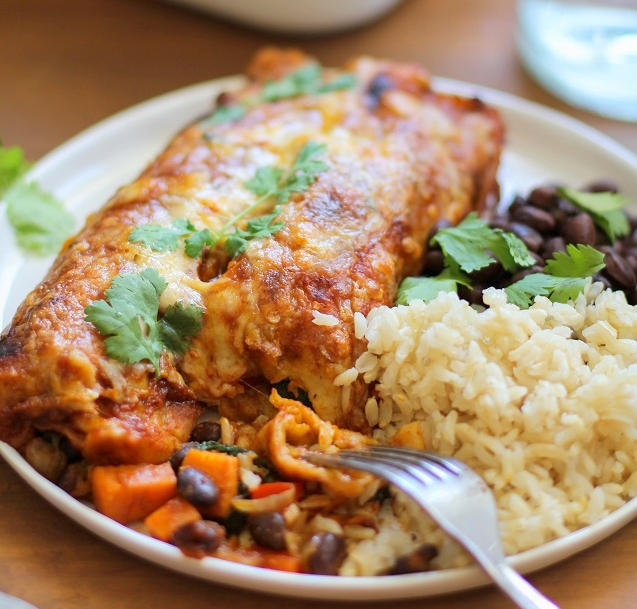 If you’re all about the enchilada goo, be sure you don’t skip this step! Cans used: 1 can black beans, 1 (10-ounce) can red enchilada sauce. Optional: Canned mushrooms, broccoli, cauliflower, kidney beans, corn etc. Head over to The Roasted Root for this delicious recipe. Feel free to add, beef, chicken, turkey, tofu etc. Veggie Burgers with a Twist. 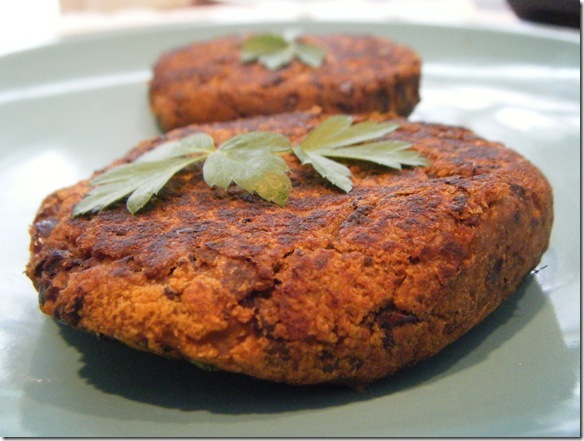 This recipe uses canned black beans and canned pumpkin to make a moist and delicious veggie patty your whole family will enjoy. While this recipe only makes 2 burgers, it's very easy to multiply. Plus, these burgers freeze well, so why not mix up a big batch and freeze a few for later use. Cans used: Can of black beans, Can of Pumpkin. Optional: Can of chickpeas, mushrooms, corn etc. Head over to Fannetastic Food for this delicious recipe and for other healthy meal ideas. 8 Can Taco Soup- How stinking clever is this? You add 8 different cans of stuff together and you get one insanely delicious soup. That’s genius! Cans used: black beans, pinto peans, diced tomatoes, sweet corn, chicken breast, cream of chicken soup, enchilada sauce, chicken broth. I have a different recipe for taco soup that I’ve loved making for a while now, but it is seriously nothing compared to this. And my old recipe is twice as much work too! Weird. At less than 300 calories per cup, this stuff is awesome. You wouldn’t think a cup would be very much, but I can barely finish it. It’s so good! Head over to High Heels and Grills for this delicious recipe. 7 Celebrity House Swaps - Who's buying? Who's selling?